6V & 12V battery optimiser - ideal for classic cars, motorcycles and many other uses. AccuMate - the affordable versatile battery maintainer. Easy to use with a simple LED display at a low price. The 6V / 12V selectable smart charger. 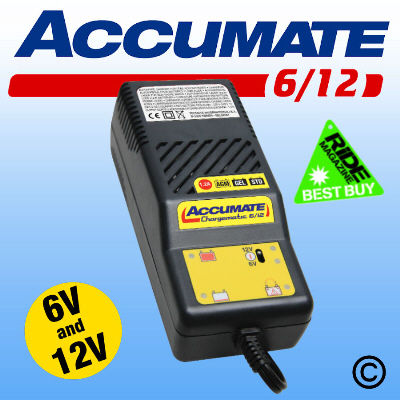 AccuMate is the sister product to the well established OptiMate motorcycle battery charger/optimiser, which has a proven reputation with over 1,500,000 OptiMates sold to date. Like OptiMate, AccuMate is designed to automatically charge and monitor batteries with no danger of over-charging regardless of time. AccuMate is suitable for all 6V and 12V lead acid batteries from 4Ah to 75Ah, making it perfect for owners of vehicles which are not used on a daily basis like classic and sports cars. Operation of AccuMate is completely automatic. It uses a 1.2A constant current charge as the main stage, while monitoring the battery voltage. When this reaches a pre-set cut off point, it then switches to an intermediate constant voltage 'float charge'. Only when AccuMate has detected that the battery is properly charged will it switch to the final stage for correct long-term battery maintenance and indicate a green LED. If at any time AccuMate detects that the battery has discharged, it will automatically revert to the constant current stage. Do not be fooled by other similar compact chargers of the same price range, which do not have the complex circuitry to safely charge batteries over long term periods. AccuMate 6-12V - 4 step charger & maintainer for 6V and 12V batteries. · Versatile, 4-step, automatic charger and maintainer for all modern and classic 6 & 12V lead-acid batteries up to 75Ah. · The green maintain (charge completed) LED means exactly that, charging has been completed. · No risk of overcharging – designed for long-term connection. AccuMate`s special monitoring circuits vary & regulate the current & voltage exactly according to the battery manufacturer’s specifications. · SAFE & foolproof - No worries about wrong connections, accidentally shorting the battery clamps or blowing fuses. Automatic protection even suppresses sparks. · Compact, yet powerful - Will safely charge 12V batteries discharged to as low as 3V (1.5V for 6V batteries) when other chargers are unable to. Charging time equal to a 3 Amp conventional charger despite the compact size. · No risk of overheating - Automatic temperature control regulates charge current to a safe level in hot or enclosed conditions. Optional accessories include a wall bracket, additional fused permanent connection leads, cigarette lighter plug lead (also fits DIN 12V socket as found on some BMW, Honda & Triumph touring motorcycles) and a output extension leads.